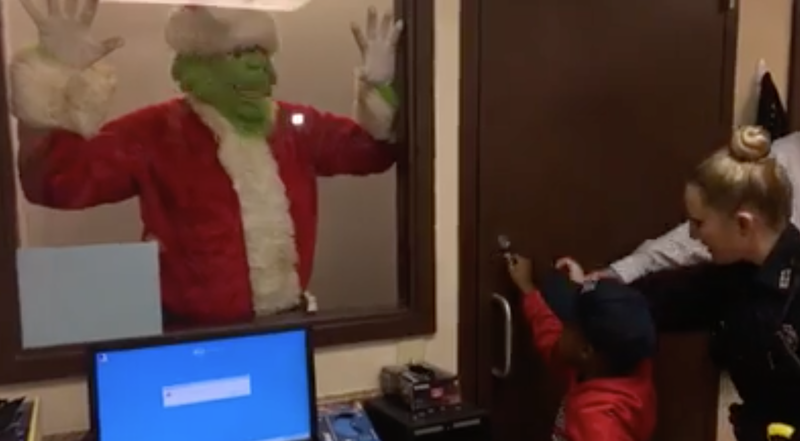 Five-year-old TyLon Pittman of Byram, Mississippi wasn't going to take any chances when he thought the Grinch was going to steal his Christmas. After watching Grinch movies on YouTube on Saturday, he did what any concerned citizen would do and quietly called 911 to report him. He hung up a few times before a 911 operator called back and took TyLon's report. On Monday, the story had started making the rounds and TyLon was invited by Officer Develle to apprehend the Grinch. The Grinch could be charged with crimes including attempted theft of Christmas, Develle said. It wasn't as much about charging him for his wrongdoing as keeping a promise to her new friend. Hanging his head, still wearing his Santa outfit, the Grinch put up no fight as he was shut in the holding cell inside the police department. "Come here Ty," the Grinch said. Taking the boy's hand in a handshake, he said, "You have saved Christmas for the people of Byram. Your bravery is unmatched. You have saved the day." "Why are you stealing Christmas?" TyLon asked him with an unwavering gaze. After a moment of thought, the Grinch just shrugged his shoulders. This little guy already knows he wants to be when he grows up: a police officer, of course.